Not all Clubfeet are the same and it is important that all people treating Clubfoot use the same terms to describe the different types. The causes of clubfoot are not clearly understood. Most commonly, it is classified as “Idiopathic Clubfoot” which means there is no known cause. “Secondary Clubfoot” which occurs when there is another disease or condition that is causing or is linked to the clubfoot, such conditions are usually neurological or syndromic disorders such as Arthrogyposis or Spina Bifida. There is also a condition known as “Positional Clubfoot”, which is not really a true clubfoot as the foot is fully correctable. Each type of clubfoot has unique characteristics and may need specific treatment. Early recognition of the type of clubfoot one is dealing with can help guide appropriate treatment. Individuals with clubfoot experience bone and soft tissues deformation and this abnormality can be presented through a range of abnormal alignments. Most commonly, Clubfoot is classified as “Idiopathic Clubfoot” meaning there is no known cause for the deformity. In Idiopathic Clubfoot, there can also be a definite hereditary influence, in that if a person has a relative, parent, or sibling that has Clubfoot, then they are more likely to have Clubfoot or have a child with it (3-10% chance). 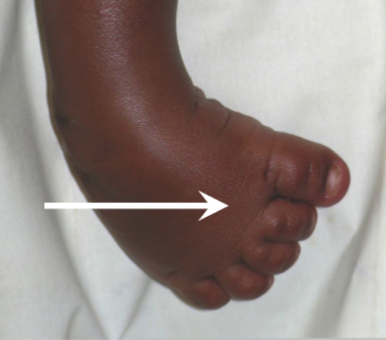 Within the group of Idiopathic Clubfeet there is a wide spectrum of impairment depending on severity, as well as whether the Clubfoot has been untreated, partially treated, poorly treated, or successfully treated. All clubfeet from birth up to 2 years of age that have had very little or no treatment can be considered as untreated clubfeet. Untreated clubfeet that have been corrected with Ponsetti treatment are termed “treated clubfeet”. Treated clubfeet are usually braced full-time for 3 months and at night up to age 4 or 5 years. The Neglected Clubfoot is in a child older than 2 years, where little or no treatment has been performed. The Neglected Clubfoot may respond to Ponsetti Treatment, but also may have bony deformity that requires surgical correction. This is a Clubfoot which involves a foot that is often swollen, has a plantar flexed first metatarsal and an extended big toe. Some children are born with atypical clubfoot, but we believe others become atypical because of poor treatment, most often occurring as a result of slippage of a cast. 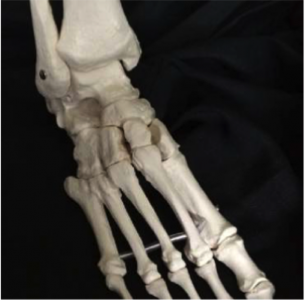 Any foot with deformity that has received any type of treatment other than the Ponseti method may have added complexity because of additional pathology or scarring from surgery. This is a Clubfoot where Ponseti Treatment has been correctly performed but there has been no significant improvement. It is often found that this type of Clubfoot is not in fact idiopathic after all and is secondary or syndromic. A congenital, neurological condition where there is failure of the formation of the bone or skin or both to cover the lower end of the spinal cord and nerves. It is often associated with neurological problems in the legs, and clubfoot. If cases present to the clubfoot clinic it is important to find out what the long-term prognosis is, and whether the child is likely to walk. If the child is likely to survive and walk then it is worth trying Ponseti Clubfoot Treatment. The success rate with simple manipulation is not high and surgery may be considered. Even if the child has a low likelihood of walking the parents might still like to try to get the feet corrected so that shoes can be worn. A congenital condition where the child is born with a number of deformities of the joints. A severe case can have stiffness of the elbows, wrists, hips, knees, and feet. People with severe cases are often unable to walk. Clubfoot is a relatively common association. Ponseti treatment can be tried and is often partially successful. The cause of amniotic band syndrome is not fully clear, but children with this condition are born with tight skin and soft tissue bands around their limbs, constricting blood and lymph flow and causing swelling. Some cases are associated with clubfoot although in the one illustrated here it is only mild. Treatment of the tight band often involves surgery. If there is a clubfoot associated, then Ponseti treatment should only be done with extreme care as blood supply to the foot can be affected and there is a risk of gangrene. These cases are best referred to a centre with surgical experience. Failure in the formation of the tibia. There is a spectrum of presentations from complete absence to a slightly short tibia. 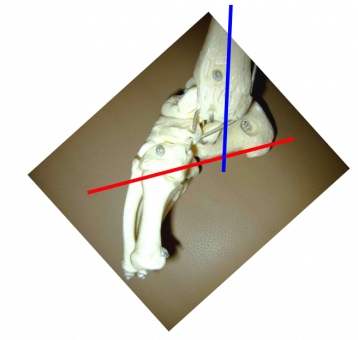 In this case there is only a very short tibia and the foot therefore adopts a varus deformity pointing to the midline. This is not a clubfoot deformity even though there is a similarity in the appearance. If there is doubt about the diagnosis, an X-ray should be taken. Treatment is very complicated and many surgeons recommend an amputation with below-knee prosthesis. There is little benefit in starting clubfoot treatment. The underlying deformity of clubfoot can be most easily understood if it is divided into four components, whose first letters make up the Acronym CAVE. These components are: Cavus, Adductus, Varus, and Equinus. We will look at them in turn. Treatment will then address Cavus first, then Adductus, then Varus, and lastly Equinus. So the Acronym CAVE is useful both to describe the deformity and to outline the treatment. 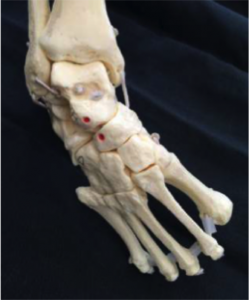 The picture below shows a medial view of the plastic model of a clubfoot. You can see that the arch of the foot is higher than normal. This is because the first metatarsal (blue line) is plantarflexed in relation to the calcaneum and hindfoot (red line). Adductus is movement towards the midline. In both the pictures above it can be seen that the forefoot is adducted towards the midline. This is the second part of the deformity of clubfoot. The pictures below show on the left a normal foot, in the middle a model of the clubfoot, and on the right a dissection of an infant’s clubfoot. In the two clubfoot pictures it can be seen that the navicular moves medially and starts to dislocate off the talus. 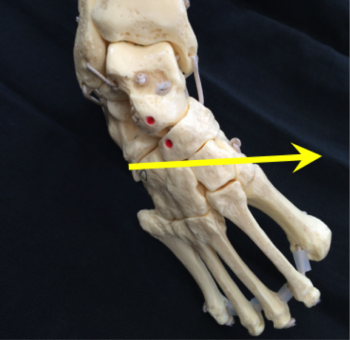 The calcaneum also rotates medially under the talus as part of the adductus deformity. Varus means movement towards the midline. 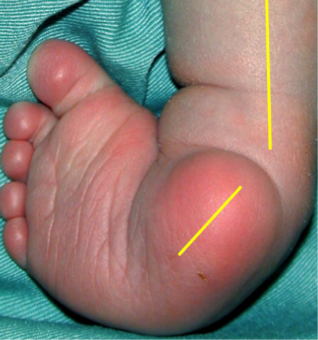 The pictures above show that the heel in the clubfoot is in varus and angled towards the midline. 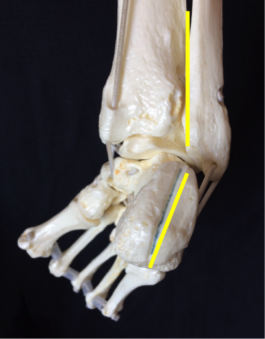 Equinus means an increase in the plantarflexion of the foot. 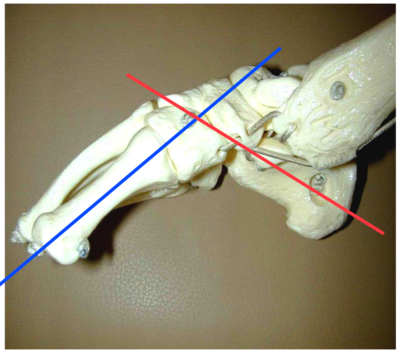 The picture below shows that the calcaneum (red line) is plantarflexed in relation to the tibia (blue line). This is the final part of the CAVE deformity and will be the last part to be corrected. The six signs are separated into three related to the hindfoot (severity of the posterior crease, emptiness of the heel and rigidity of then equinus) and three related to the mid foot (curvature of the lateral border of the foot, severity of the medial crease and position of the lateral part of the head of the talus). 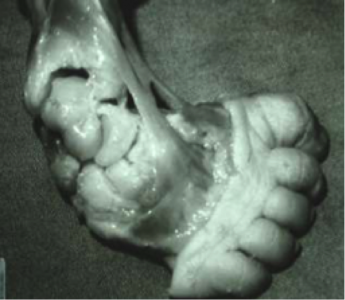 Thus each foot can receive a Hindfoot Score between 0 to 3, a Midfoot Score between 0 to 3 and Total Score between 0 to 6. ↑ Africa Clubfoot Training Project. Chapter 1 Africa Clubfoot Training Basic & Advanced Clubfoot Treatment Provider Courses - Participant Manual. University of Oxford: Africa Clubfoot Training Project, 2017. ↑ 3.0 3.1 3.2 3.3 3.4 3.5 3.6 3.7 3.8 Africa Clubfoot Training Project. Chapter 2 Africa Clubfoot Training Basic & Advanced Clubfoot Treatment Provider Courses - Participant Manual. University of Oxford: Africa Clubfoot Training Project, 2017. ↑ 4.0 4.1 4.2 4.3 Africa Clubfoot Training Project. Chapter 15 Africa Clubfoot Training Basic & Advanced Clubfoot Treatment Provider Courses - Participant Manual. University of Oxford: Africa Clubfoot Training Project, 2017. ↑ P.J.Dyer, N.Davis, The Role of the Perani Scoring System in the Management of Clubfoot by the Ponseti Method, J Bone Joint Surg [Br] 2006;88-B:1082-4.